Global cues, macro data drag mkts. Global worries and poor GDP data hit the stock markets on Tuesday as the benchmarking indices crashed over 2 per cent fearing China slowdown. A sharp sell-off in the stock market wiped out over Rs 2 lakh crore from investors' wealth today as the benchmark Sensex plummeted 587 points following weak domestic and global macroeconomic data. Total investor wealth of BSE-listed companies tumbled by Rs 2,02,654.47 crore to Rs 96,25,276 crore. Mumbai: Global worries and poor GDP data hit the stock markets on Tuesday as the benchmarking indices crashed over 2 per cent fearing China slowdown. Experts say that the market is exposed to consistent selling pressure and suggested to accumulate quality stocks as the country's fundamentals are strong enough to rebound and China will have less impact on the economy. All sectors closed in the red while banks worst hit. 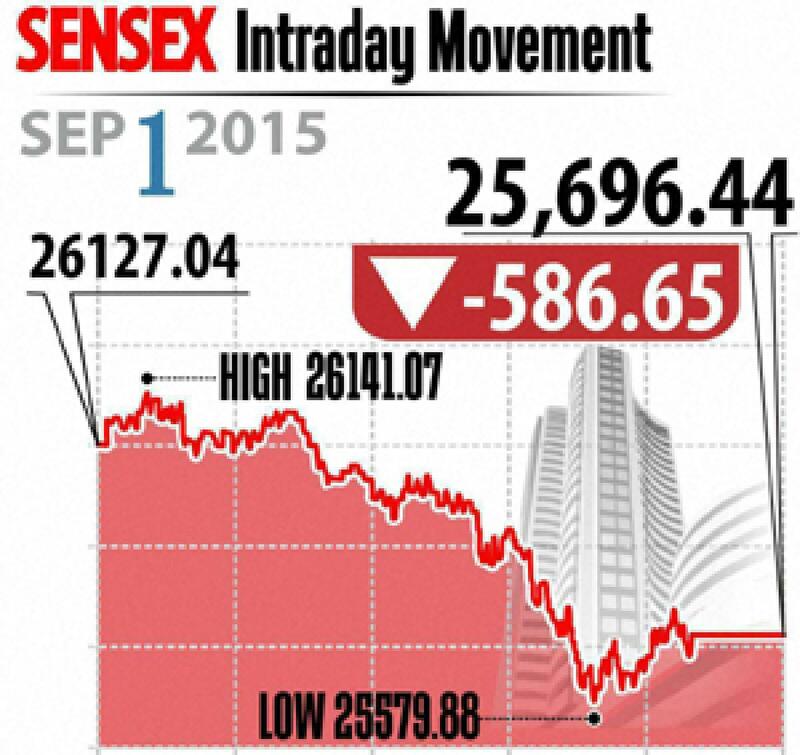 Sensex down 597 points at 25,696 level, while Nifty fell 185 points at 7,786 level. Also the broader markets underperformed with midcap and smallcap indices down 2 per cent and 2.1 per cent, respectively. Interestingly, rupee got recovered 13 paise at 66.36 against US dollar. On sectoral front, all sectors closed in negative zone with bankex down 3.6 per cent followed by metal index fell 3.2 per cent. Out of 30 shares of Sensex, about 29 closed in red, and one stocks gained marginally. HDFC Bank down 3 per cent, Axis Bank down 5 per cent though both has cut base interest rates. Other financial stocks also fell as ICICI Bank, SBI, HDFC down up to 3.5 per cent. Metal stocks also reported heavy sell-off with Vedanta, Tata Steel, Hindalco, Jindal Steel and Coal India lost up to 5 per cent each. On the other hand, oil company share prices also melted following cut in petrol and diesel prices. BPCL fell 2.4 per cent, HPCL down 3.3 per cent and IOC declined 2.3 per cent. The gainer: Sun Pharma, up 0.34 per cent at Rs 900.75. The losers: Axis Bank, down 5.24 per cent at Rs 480.15; Hindalco Industries, down 5.18 per cent at Rs 75.90; Tata Steel, down 3.93 per cent at Rs 216.20; BHEL, down 3.91 per cent at Rs 217.65; and Vedanta, down 3.80 per cent at Rs 94.85.